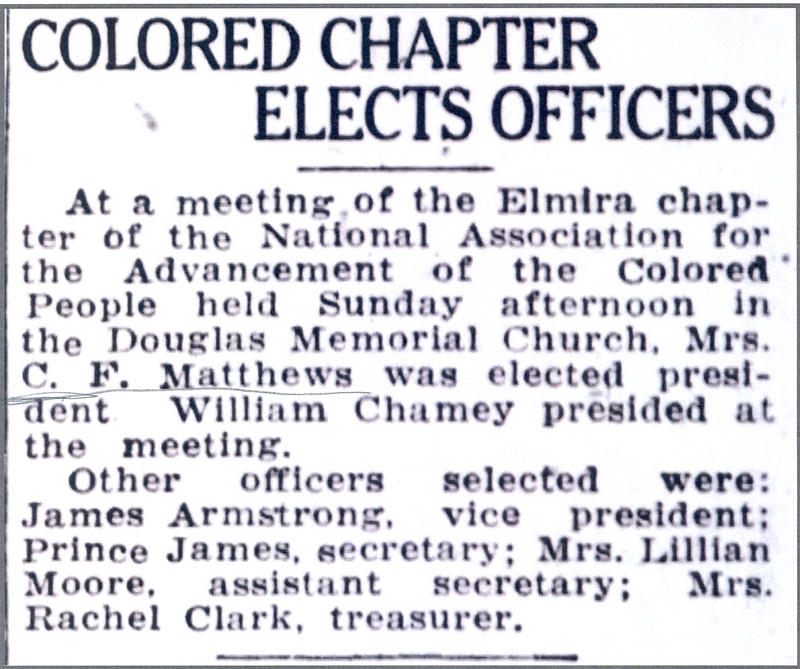 For the last 100 years, the Elmira-Corning Branch of the NAACP (National Association for the Advancement of Colored People) has worked to improve the lives of African Americans within our community. 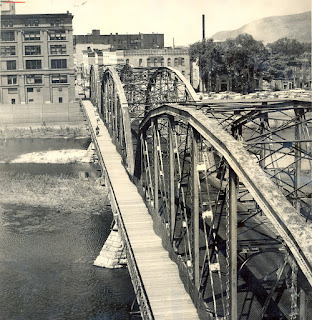 The local chapter recently donated their history collection to the Chemung County Historical Society in order to ensure that the stories of the men and women involved in their struggle are accessible to the wider community. 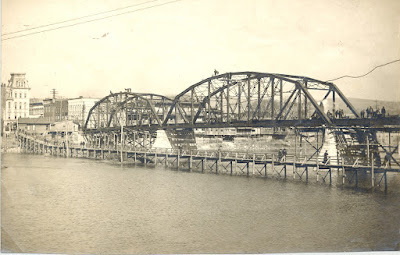 Over the coming months, CCHS will be sharing some of those stories here and in an up-coming on-line exhibit. Stay tuned. The entire collection is available for viewing during our regular research hours. Mrs. Cordelia F. Stewart Matthews, daughter of Thomas Stewart, was the local branch of the NAACP’s first president in 1917, as well as its fourth in 1925. Heavily involved in politics, she served as the Republican Committeewoman for Elmira’s First District, Fourth Ward. 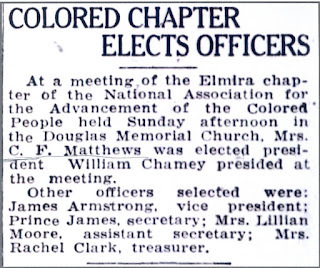 She was not only the first Black woman in the county to serve in such a role, she was the first Black person to do so. An active member in the A.M.E. Zion Church, she often represented the Christian Endeavor both regionally and nationally. Locally, she worked hard to help uplift the Black community. 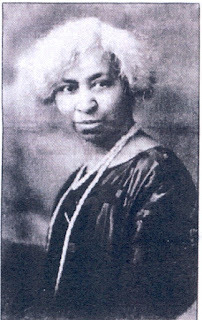 In 1918, she was involved in a lawsuit against a real estate company which refused to rent or sell property to “colored people or undesirable foreigners.” In order to obtain an official charter from the national organization, the local NAACP needed 100 members. Matthews arranged for Mrs. Addie W. Hutton, an NAACP leader from New York City, to come and give a presentation on the organization and its aims at the Bethal A.M.E. Zion Church. Although few people attended, they were able to get the membership they needed to be chartered in 1918. The woman could not stop founding clubs. On February 14, 1924, she established the Nannie Borroughs Club at the local YWCA. Named for a nationally known Black activist and educator who was apparently a personal friend of Matthews, the club was intended to be a safe space for Black girls to socialize and discuss the issues of the day. A few years later, she established the CFM women’s book club, also at the YWCA. The CFM Club lasted well into the 1950s, twenty years after Cordelia Matthews’ death in 1936. The Nannie Borroughs Club eventually became more of a women’s support group before ending in the late 2000s. 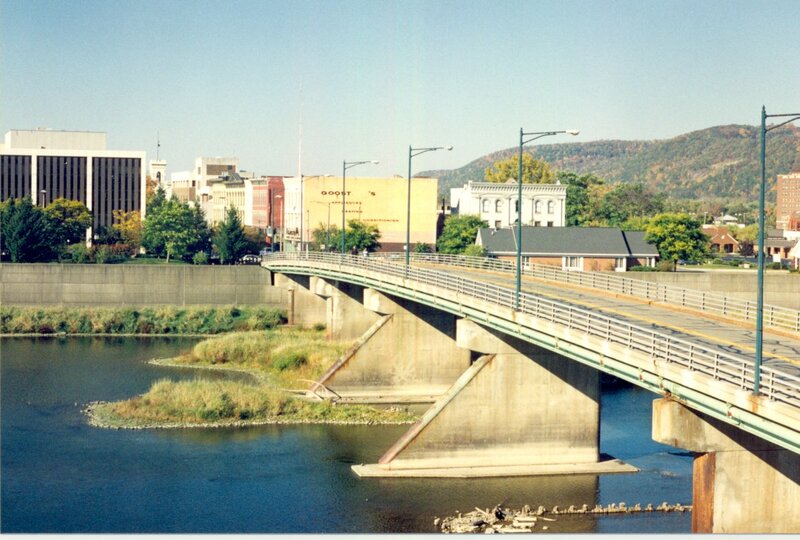 I have a big, bittersweet announcement to make: I have accepted a new job as a Visitor Experience Coordinator at the Catskill Interpretive Center in Mount Tremper, NY and I will be leaving my position at CCHS on August 31. This is an exciting opportunity for me professionally and personally, but I would be lying if I said I didn’t have any sadness about leaving. Please accept this rambling farewell letter to all of you--our readers, friends, and visitors--as my final CCHS blog post. I have been at CCHS for over 5 years now and moved to Elmira having never been here before. I know this region has its struggles and people tend to dismiss it, but as a newcomer, I found incredible opportunity. As a historian, I marvel every day at how rich this county’s history is (and will continue to be far into the future). As an educator, I’ve had the fortune to work with thousands of local children and have seen how smart, empathetic, and interested in history they can be. Please embrace these positives. 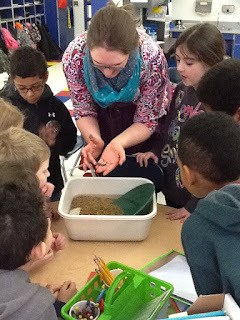 Just look at these smart 2nd graders learning about gold panning in their westward expansion unit! I’m grateful to everyone out there who read one of my blog posts, attended a program at CCHS, or bought my book. As you may have noticed, I’m not a historian who is interested in the “big” popular stories. Sure, they’re fine and all, but I like the weird stuff, the small tales that normally get lost when we look at the past. My favorite kind of history is infused with humor. I’m particularly proud of Curiosities of Elmira and would be remiss if I didn’t take one more opportunity to shamelessly promote it. I’ve worked hard to bring our local history to you in new and novel ways, with our History They Didn’t Teach You in School series being my favorite of our successes (don’t forget to sign up for Joy! in December). Thanks to everyone who attended these programs, let us be totally silly, and threw things at Bruce (you’ll understand what that means if you’ve been to the programs…). You always made it fun for me to lead those tours. I also can't leave this blog post without mentioning my alter-ego Mark the Mammoth. I hope you follow him on Twitter. Having built his account from nothing to mini-celebrity, he is strangely one of the parts of this job I will have the most trouble letting go of. Is it weird that Mark is one of the things I'll miss most about this job? I won’t go on and wax poetic here for much longer. As you know, my coworkers, Bruce, Erin, Christine, and Rachel are fantastic and smart. I’ve been lucky to have a chance to spend the last 5 years learning from them. They’ll be stuck picking up the slack while they wait to hire my replacement, so please be extra nice to them in this transition period as they add even more work to their busy schedules. And please be as nice to the new educator as you all were to me. If you find yourself in the Catskills, please feel free to say hi! On August 4, 1904, a 14,920-pound siege gun arrived in Millport. 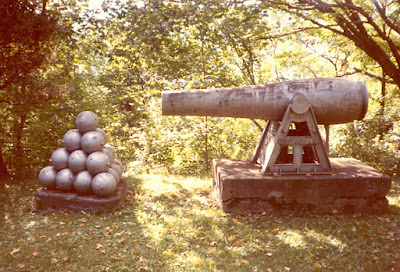 The artillery piece was made by the Fort Pitt Foundry in Pittsburgh, Pennsylvania for use during the Civil War. The army shipped it to Millport from Liberty Island, New York to serve as a monument to the local soldiers and sailors who had served in the war. Dozens of men from Millport served during the Civil War. Many enlisted in the 50th New York Engineers. Company G was almost entirely recruited from village. 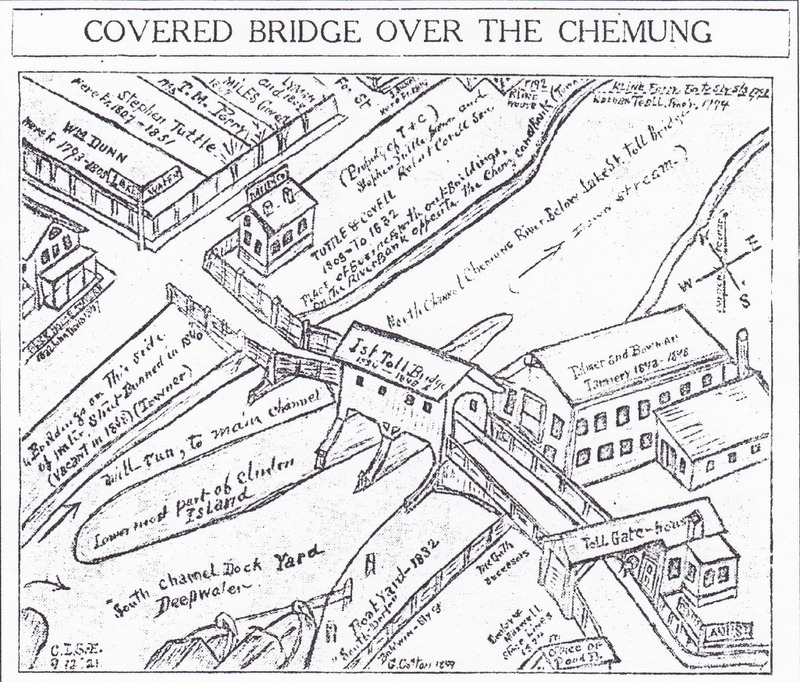 The regiment built roads, battery position, forts, and bridges. It was attached to the Army of the Potomac and saw action at Yorktown, Antietam, Fredericksburg, Gettysburg, and Rappahannock Station. The men of the 50th were at Appomattox Court House to witness the surrender of General Lee and his army. In 1883, veterans of the war established Post 416 G.A.R. (Grand Army of the Republic) in Millport. 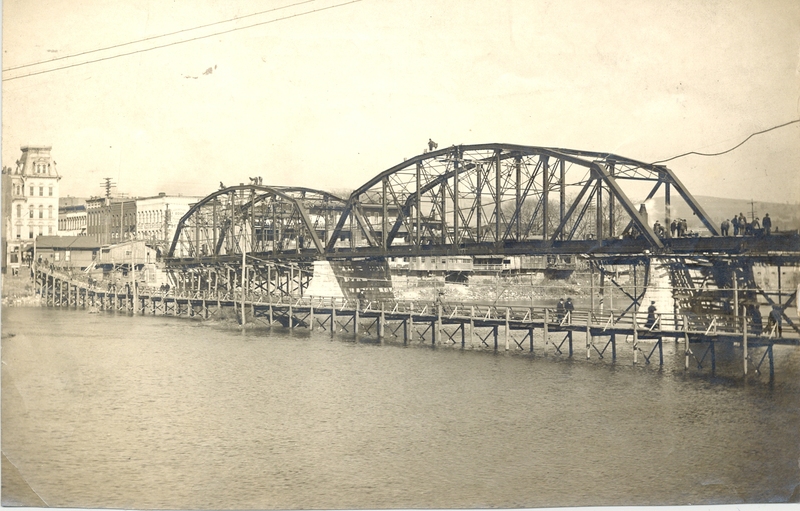 The post was named for Private Wilson Dean who was a member of Company A, 89th New York Volunteers. He had enlisted in Catharine in 1864 at the age of 27. He was captured in Cold Harbor, Virginia and died at Andersonville. In 1904, members of the Wilson Dean post arranged to create a monument to honor its namesake and all the others who had fought during the war. monument and several more throughout the cemetery. 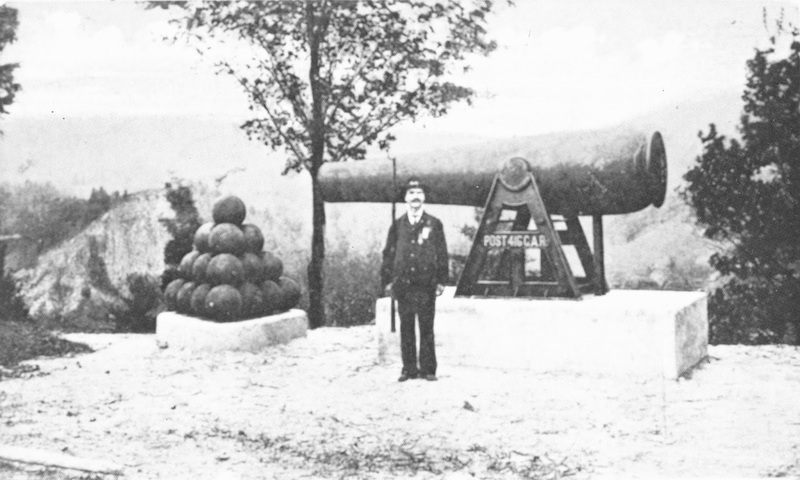 The siege gun was brought to Millport on a flat rail car which was shunted onto a Pennsylvania Railroad siding. From there, it was up to the people of the village to get the gun to its final location in the Millport Cemetery. The cemetery was almost a mile from the railroad siding and some 400 feet up a steep dirt road. The cannon was moved onto a low wheeled rig provided by the Reeves Machine Works. It took ten teams of horses and additional men hauling on ropes to move the piece to the cemetery. 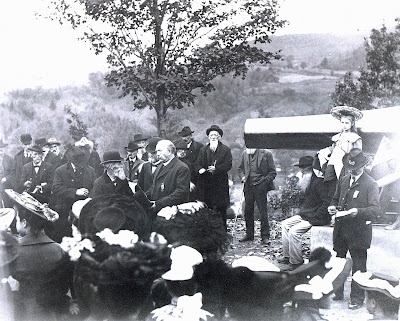 People cheered the workers along the way and, after several pauses to rest, the gun was placed on a concrete base in the northwest section of the cemetery near the graves of several Civil War veterans. Its barrel was pointed toward the south. Length of gun, 12 feet. Diameter, 32 inches. Diameter of bore, 10 inches. weight of shells, 7,300 pounds. The monument was officially dedicated on October 13, 1904 at a daylong celebration. At 11 o’clock in the morning, G.A.R. members and other citizens marched to the cemetery. Post commander R.B. Davidson delivered opening remarks which were followed by the singing of a patriotic song and a prayer by Rev. E. Burroughs. Several young Millport girls then pulled strings which let the drapery that had been covering the cannon fall way. The crowd sang another patriotic song then listened to an address given by Dr. Robert P. Bush, a distinguished orator from Horseheads and a Chemung County assemblyman. The festivities did not end there, however. At noon, the G.A.R. members and their guests returned to the village and had dinner at the Baptist Church. At 1:30pm, additional dedication exercises and speeches took place at the masonic hall. Sherman P. Moreland of Van Etten gave the keynote address. There was then a reception held to honor the surviving members of the famous 48th Regimental Band. There was singing, addresses, music, and stories by veterans. Coffee and hardtack were served at the close of the evening. For almost 90 years, the cannon stood guard over the Millport Cemetery. Over the years, however, the monument suffered from the effects of weather and the occasional vandal. The concrete base had begun to crumble, and the gun and pyramid of cannonballs, which had been painted silver at some point, were looking worn. In the summer of 1991, Duane Hills, commander of the Elmira Sons of Union Veterans, and a crew of his men went to the Millport cemetery four time to restore the monument to its former glory. They patched the concrete, removed graffiti, and repainted the gun and cannonballs. On October 13, 1991, they hosted a small ceremony to rededicated the memorial. At the conclusion of the event, fifteen men dressed in Union uniforms fired a rifle volley in honor of those who had served during the Civil War. 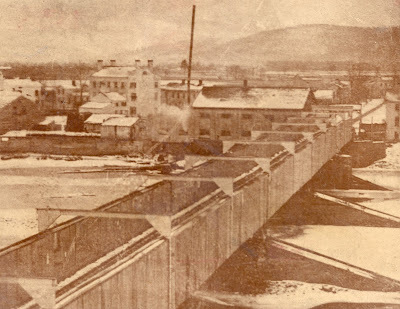 In the autumn of 1832, the Village of Elmira was rocked by scandal. On the morning of October 19th, a baby, about three weeks old, was found abandoned on a wood pile. There were few clues as to the baby’s identity. No note. No monogramed cap. Just a simple white flannel blanket over superior-quality underclothes. No one knew how long it had laid there, but it was lucky to be found alive. The child spent the next few months in the care of Mrs. Atkins, who had milk enough to nurse it, before being sent to the poor house. The baby on the woodpile was not the last to be abandoned in Elmira. 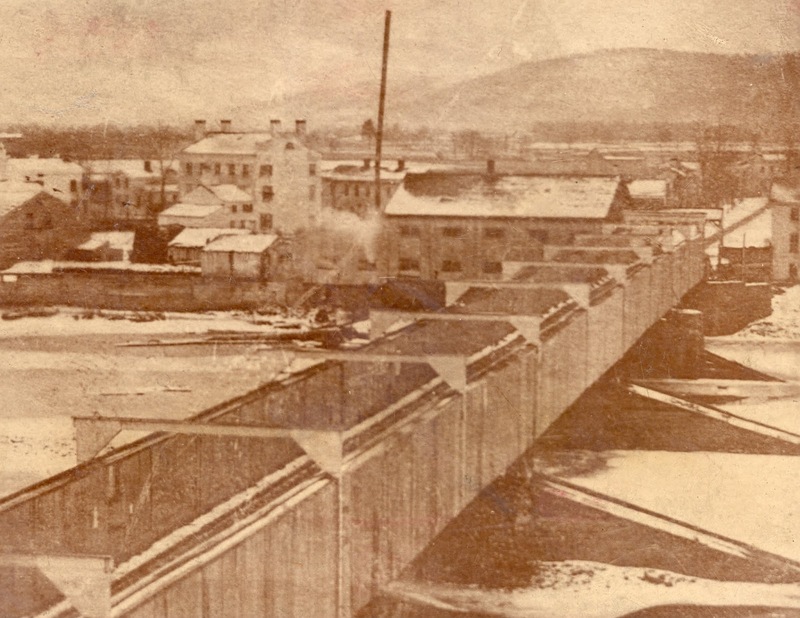 On April 7, 1898, police were called to the Erie Railroad Depot to take custody of a three-week-old infant found in a cloth satchel on the train which had just arrived from Corning. Luckily, the baby was unharmed. Others have not been so lucky. 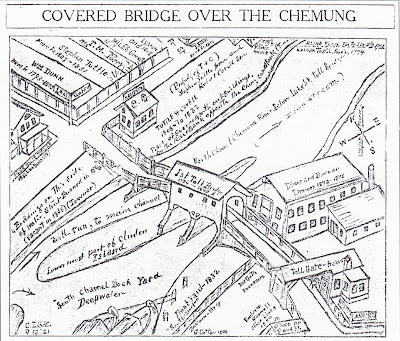 The same year the baby was abandoned on the train, another was found dead on the banks of Newtown Creek on November 26, 1898. Others have been found in the Chemung River and at the Sullivan Street dumping grounds. It would be nice to think they died before they were left like garbage. In the case of Baby Smith, her father confessed to weighing her down in a creek with rocks after he lost his job and couldn’t find anyone willing to adopt her. In most cases, no one had any idea who the parents were. In 1832, suspicion landed on Miss Sally Armstrong. 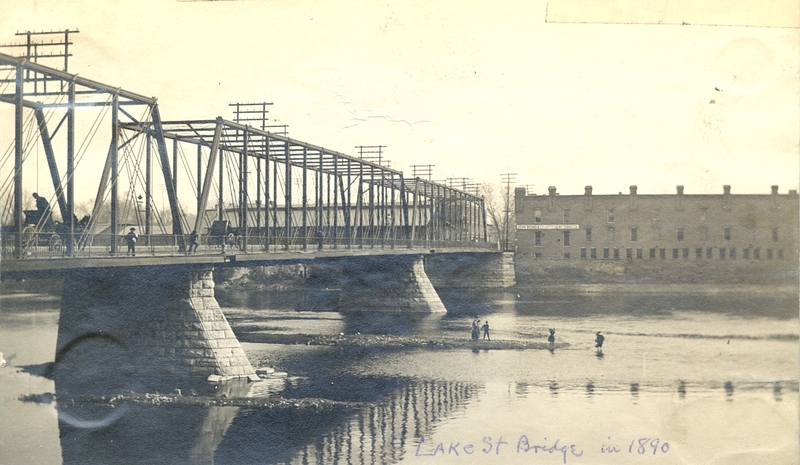 Sally had spent the spring and summer working on her brother’s Elmira farm before returning to her parents’ home in late October. The timing was right and a young, unmarried girl like Sally would have every reason to dispose of an unwanted child. In those days, having a child out of wedlock could destroy a woman’s marital prospects and doom her to a life of poverty. In March 1833, the rumors got so bad that her brother’s neighbors, Richard and Ann Smith, felt compelled to write a letter to the local newspaper saying that they knew for a fact that Sally had not been pregnant. In 2000, New York State passed the Abandoned Infant Protection Act which made it legal for parents to anonymously abandon newborn infants so long as they left them at a designated safe area such as a hospital, social workers’ office, or police or fire station. In 2010, the law was expanded to include infants 30 days or younger.